Autism Recovery, how long is it going to take? This is a question that I frequently get from new biomedical parents. And it is certainly a doozy. For those of you who have been on this journey, you know what a loaded question it is. Recovering your child takes everything you have and more. It takes years of strict dietary intervention, daily supplements and routine methylation support via methyl B12 injections. For those of us who have used biomedical treatment to support autism recovery, we know the incredible transformation that happens. Biomedical treatment needs to start from a place of acceptance. Its first and foremost goal is to address the medical aspects of autism that are creating pain and discomfort. When the underlying medical issues are assessed and treated, behaviours driven by pain and/or sensory issues drastically improve. The next step is to support age level communication, social and learning. Recovery is the optimization of brain function for every child. We are supporting recovery of a child diagnosed with autism, not recovering them from autism. Biomedical families know that there are often gains quite soon after changing your child’s diet or adding in methyl B12 injections. We know that there are so many different treatments to try with the goal of getting your child to develop new skills as quickly as possible with the hope of creating opportunities for age level skills. You know that recovery is a journey, not a destination. Writing about recovery felt like a statement of finality and what I wanted to share was the joy and sorrow of the biomedical treatment JOURNEY. Studies show that the gut flora for children diagnosed with autism is different than typically developing children. The “unhealthy” gut flora feeds on complex carbohydrates and cause damage to the brain by increasing inflammation, decreasing absorption of fats and impairing both detoxification and methylation. Methylation is the process by which children develop. Studies show that 90% of children diagnosed with autism have methylation impairment. Methylation supports like methyl B12, DMG, TMG and SAMe can all help to optimize development for children experiencing developmental delays. The IDO1 pathway takes 95% of the body’s tryptophan which is needed to make serotonin. Low levels of B6 and B3 (often low because of gut issues and methylation problems) cause this pathway to become upregulated leading to excitability in the brain that can cause damage. Too much of the neurotransmitter (brain chemical) GLUTAMATE causes the function of the brain to change resulting in many of the “autism” symptoms we see like scripting, stimming, obsessions, fixations, anger, aggression and sensory processing problems. All of the above lead to damage to the cell membrane which surrounds all cells which then “shreds” (lipid peroxidation) decreasing the mitochondria’s ability to produce energy needed to support development. Mitochondria produce all the energy in the body, so stopping the damage and repairing is the key to recovering kids with autism. The approach used at our clinic has been fine-tuned over the last 14 years. It has been my privilege to work with over 5000 families. For the families that have been able to commit to regular follow-ups and follow our recommended “paleo” diet, cocktail of supplements and regular meyhyl or hydroxy B12 injections, the recovery rate is 30%. These children are highly recovered and have many if not all age level skills. The other families who are able to commit to treatment (which takes at least 18-24 months) see significant gains in language, social and cognitive development. Consequently, their children are not in pain, have improved sensory symptoms, better digestion, don’t hurt themselves, sleep better and are able to have a higher quality of life. So, let me tell you what is happening right now as I type this blog. Magnus is our youngest son. He suffered a severe regression after a surgery at 16 months to repair an equally severe birth defect. At 18 months, he was unable to walk walk properly or long distances, he stumbled and fell constantly, he had very few words and they were difficult to understand and he struggled with a massive feeding issue including difficulty chewing and swallowing. He was self-injurious and aggressive due to extreme noise sensitivity and food textures. Magnus’s feeding was also extremely restricted and he would smash his face and head on the table when we tried to introduce anything other than cashews. Autism Recovery using biomedical treatment. Changing Children’s Lives. I said “Yes, but you go ahead buddy”. He drank and then handed the bottle to me, then scampered off and a couple of minutes later brought over some GG bites (a sesame snack we order from JK Gourmet) and asked if I needed a little snack while I worked. Magnus is the sweetest boy I know. I know what he is thinking, because he can now tell us after 4 ½ years of biomedical treatment, speech therapy and hyperbaric oxygen treatment. I know that he can learn. At this point, on par in most ways with his peers, and in some ways with a more expansive capacity. I am not sure what his future holds in terms of challenges but I know biomedical treatment has transformed his ability to face those challenges and that they are probably going to be very similar to every other kid his age. At this point he is in SK and he doesn’t need a lot of extra help and is cognitively at age level. He is still catching up socially but plays with friends every day. We need to keep supporting his social communication and play. 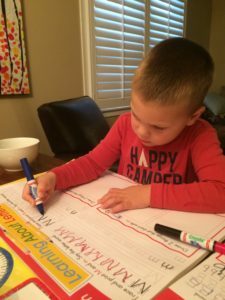 He was at risk for a fine motor disability and now writes words and his name. This is what a recovery journey looks like today but it has taken everything we had to put in as a family. With my lovely husband on board, my children helping and showing unbelievable maturity and patience, with the focus of helping Magnus have the happiest and most complete life we could create for him; and I can tell you from the front lines that biomedical treatment works. 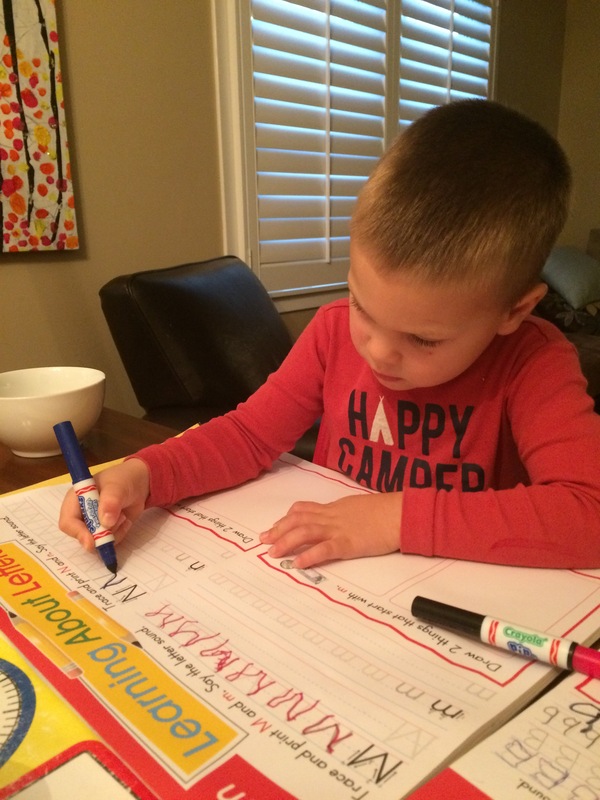 How do you handle telling your child about their developmental concerns? Yesterday, as I was pulling out of the driveway and Magnus ran out after me. He then told me he needed to tell me something. I stopped the car and put the window down and asked “What’s up, buddy”? He asked, “Where are you going”? I told him I was going to work. “Oh”, he said thoughtfully. “What do you do at work”? “I am a Naturopathic Doctor who helps kids with autism”, I answered. “Do I have autism”, Magnus asked. I sat frozen in the driveway, not knowing how to answer. He has been aggressively treated since he regressed at 16 months. For 4 ½ years we have struggled to improve language, social and cognitive skills while simultaneously addressing severe feeding issues and possibly even more severe sensory processing issues. We spent years changing diapers and sheets that were covered in diarrhea. Years applying every cream and salve we could find to help address severe eczema. Cracked and bleeding that caused discomfort from head to toe. Years of sleep deprivation, years of screaming, head banging, restricted eating and bolting out into the road. I don’t know how everyone else defines recovery. My definition is my daily interaction with a boy whose future looked bleak; a boy who could barely walk, and couldn’t talk. A boy who today, 4 plus years into our journey, just spent 30 minutes wrestling with his Dad and after winning yelled “In your face!”, a taunt learned from his 10 year old brother. By the time I got home from work, Magnus’s brother and sister had explained that he has the “good autism”. The kind of autism where you have all the brilliance and problem solving skills without the debilitating sensory overload, fatigue and digestive pain. Hence, our family refers to Magnus’s autism as medically treated. The “good autism” is underneath all of the medical concerns. The “good autism” is what we need to reveal by removing medical issues that are obstacles to optimal functioning. This year, I have been saying this a lot: “I don’t know any other way”. I know that daily, yucky supplements, the paleo diet and continual methylation support can support the difficult journey of recovery. The supplements taste horrible and the diet seems completely impossible at times but I can share with you that as a tired and fried biomedical parent; I wouldn’t change a thing and I would do it all again knowing that this arduous journey would allow us to have this level of interaction, communication and hope for the future. So, what is it going to take? First, try the treatment. For at least 3 months. Find a good biomedical doctor who has helped to recover thousands of children. Work with your partner, family, therapists, other children and friends to give your child every opportunity to reach the highest level of success. It takes all you have… and more. The parents who are on this journey would almost always agree that this is the hardest, most incredible thing that you will ever do. When your child is on the right biomedical treatment, they begin to recover. The longer they are treated, the more they recover. Like anything in life it takes hard work and commitment. There is no “magic bullet”. Above all, believe in your child and their ability to recovery from the medical obstacles creating negative autism symptoms. Autism Recovery – What is is going to take? A ton of yucky supplements! Methyl or hydroxy B12 injectionsIf you haven’t looked into biomedical treatment, there definitely IS another path you can try. Addressing children’s medical concerns today, results in even more developmental opportunities in the future. As parents, we know that biomedical treatment drastically changed the trajectory of Magnus’s life resulting in optimal development.Biomedical treatment changes children’s lives; I know, because it changed our son’s life… and ours.